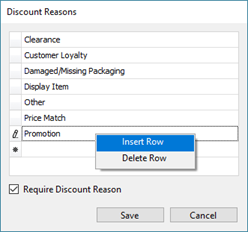 Discount Reasons allow you to track why your employees are adjusting prices outside of those automatically applied by Coupons or Promotions. 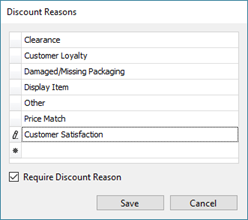 From the Ascend Desktop, click the Options tile, then select the Sales and Returns topic. 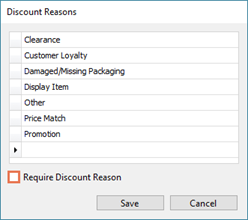 In the Discounts section, click the Reasons button. We’ve provided several common, default reasons – but your store may require different or additional reasons. To add a new reason, click in the empty cell at the end of the list and just start typing. 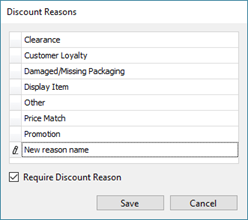 To add a reason in a specific position in the list, right-click the reason above which the new reason should display and select Insert Row. 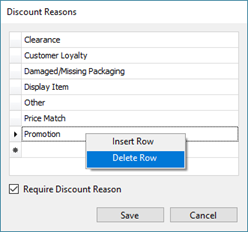 To remove a reason, right-click it and select Delete Row. To rename a reason, double-click the reason and edit the text as necessary. 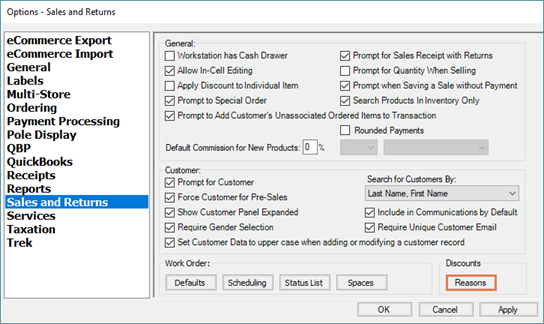 When your changes are complete, click the Save button, then click the OK button.